Brush the chicken with olive oil and season with salt, pepper and paprika and put in the oven at 425 F for 30-35 minutes until cooked through. Place the mushrooms on a baking sheet, drizzle with olive oil, salt and pepper and bake in same oven as chicken for 15-20 minutes. For the dressing, use 1/2 cup olive oil, 2 tbsp of Dijon mustard, 2 tbsp of lemon juice and 2 tbsp chives, chopped. Put all the ingredients in a mason jar and shake until combined. When chicken is ready, remove the bone and skin and slice it. Plate all the ingredients on a nice serving dish and drizzle with the dressing. 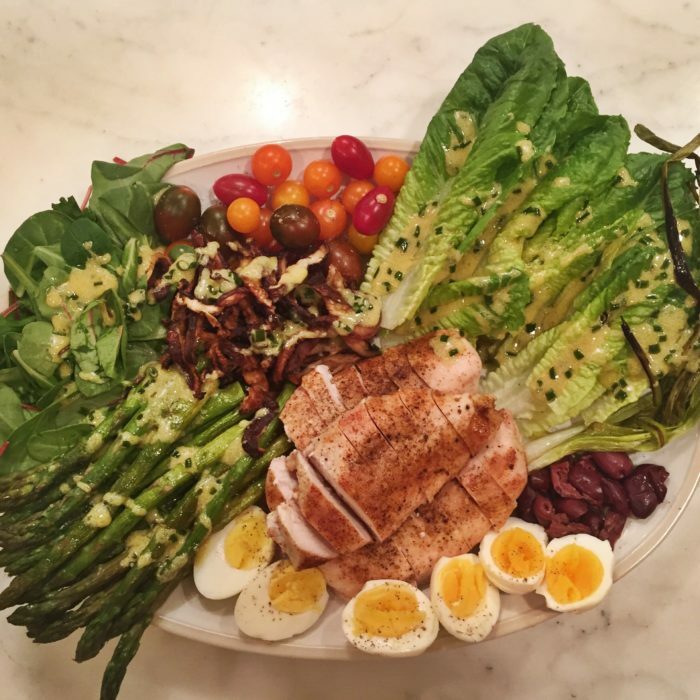 I don’t like when a salad is soggy so I always serve with extra dressing on the side for whoever likes more…..
My family and I loved this! Thank you for making your recipes delicious yet quick and easy!